Chalk Dust included a Buried Alive tease from Trey. Love You featured Fish on trombone and was dedicated to his friend "Robert." The Mango Song – only the second time it had ever opened a set, and one of only three times it ever opened a set in all of the pre-hiatus years. * It’s difficult to understand why it was utilized in that way so infrequently, as it seems like a fine, upbeat first set opener with its contagious bouncy grooves . The Sloth – another great placement for a song that instantly pulls the listener in. Solid version; the band sounds tight and in sync. The Man Who Stepped Into Yesterday – some of the most melodic and beautiful music Trey has ever written. I’ve always thought it’s pretty special when they play this. Another example of their tuned-in tightness. Avenu Malkenu – How can you not love this? Go Mike! Phish manages to make this song sound Phishy enough, yet at the same time staying true enough to the song itself. The Man Who Stepped into Yesterday – the contrast in styles between these two songs, linked together as Phish plays them, is quite stark, but it works. Runaway Jim – Another toe-tapping crowd pleaser. It seems as though this is the 1st time in the set that the band gets deep into the music. A straight-forward, rollicking rocker. Foam – Classic Jim/Foam pairing. Getting deeper now, into the music. Sublime and sweet; laid back, relaxed, no sense of hurry, no need to rush; patient. Again, the tightness of the band – they’re all so in-tune with one another, so smooth. About 6 minutes or so in, as it’s climbing upward, what must first-timers or newcomers been thinking? What other bands out there at the time playing this style of music sounded like this – like one living, breathing organism, as opposed to four guys with instruments? Guelah Papyrus – Short, solid and sweet. Funny to think that, as good as it sounds, they’d only been playing it live for a little over a week. Wonderful interplay between Trey and Page. Fishman sounds like he’s playing around with some different beats, really making his presence felt. 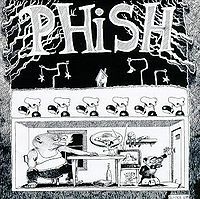 My Sweet One – Fishman parlays that heavy presence into the opening of My Sweet One, but his thunder is very quickly usurped by Page, though both Fish and Trey fight for dominance, while Mike solidly backs the whole thing steadily. Fun, early Phish. Tweezer – The very first thing that jumps out with this Tweezer is the inspired play of Mike Gordon. He’s directing everything during the opening, and it’s joyous. Fantastic interplay all throughout, truly, by all four members. There’s a very loose central theme, and each band member appears tethered to that central theme, able (and encouraged) to meander off on their own, but as they’re tethered, they never get too far away. There’s a nice increasing of the tempo and a buildup musically that, instead of peaking, is sort of deconstructed of its own free will, before breaking down almost completely, to reveal the reprise of the proper Tweezer riff. Well played. Reba – The fans in Northampton got a show that, looking back on it on paper now, years later, seems somewhat tame. But Phish brought freshness and energy to the campus this evening, as well as musical complexity and dexterity. Reba hadn’t yet hit the heights that it would in years to come, but the early 90s Rebas had a jazzy earnestness and intricacy that stands strong in its own right. The slinky second-half jam was speedier then, but no less lovely. Chalk Dust Torture – Like Guelah Papyrus earlier in the set, they’d only been playing this one live for about a week. Seems impossible. There’s a few hiccups along the way, but they turn it into a fun little rock excursion before bringing back around and closing it out. Golgi Apparatus – Standard, energetic set opener. Buried Alive – Frenetic Page and bomb-dropping Mike, Guitar screeching Trey and Fishman chug-chug-chugging along . . . frenzied auditory bliss! Fluffhead – clearly a crowd favorite, based on their reaction. The song speaks for itself, really; everything you’d expect in a Fluffhead is here. Fishman was quite impressive, in particular. It’s easy to see how, back in 1991, in less critical times, a Fluffhead would have been an absolute high point of a set, if not the whole show. The Landlady – I’ve always thought this worked well as a stand-alone song. Maybe they’re just waiting until they play again with horns! Fishman impressing again with that … is it salsa? beat. Bouncing Around the Room – Again, thinking back to less cynical, critical times, it’s easy to understand how Bouncing became a favorite for so many, with its springy, infectious, happy melody. Looking at it for what it is, and not what it became or what it was interpreted as, it was a pretty good little song. working together to fill up a lot of the ‘empty spaces.’ Fishman, doing what he does so good: providing the backbone you didn’t even realize was there, but would be lost without. Harry is a journey of song styles, an epic tale in its true sense. Cavern – The ‘segue’ into Cavern was a bit abrupt, but hey, we just came back from a splendid Hood climax, so it’s all good. 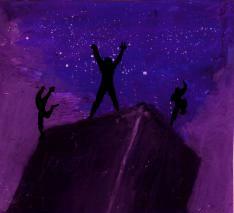 Cavern brings us back down to earth to groove. Mike is picking at his bass spiritedly (as he did in Hood!) and is just commanding we hear him. Overall, it’s been the Mike and Fish show, with no ill reflection on Page or Trey. Love You – I’m always impressed first and foremost with Trey’s drumming skills. Fishman, when he wants to be, is just great. After his fiery performance thus far in the show, he absolutely deserved a chance to sparkle in the brightest lights. His trombone skills are better than I expected. The Squirming Coil – Another showcase for all four band members to weave seamlessly between their own course and a larger group groove. Page, of course, shines quite brightly. Llama – Such a great, high energy song with which to close the set. Such perfect song placement all throughout the show. 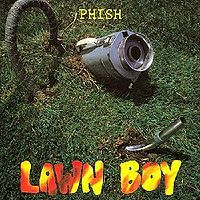 Lawn Boy – Lounge-y goodness! Suzy Greenberg – An interesting opening section, but relatively standard thereafter. Yet, at this point in time, pretty early on, this song sounds so fresh and vibrant. Contact – I guess Fishman had Love You, Page had Lawn Boy, so Mike gets Contact. Seems fair. Always a treat. Page is pretty impressive with his flamenco flare. Rocky Top – A fantastic encore in its own right, but as the capper of a 4-song encore? Who could possibly complain? 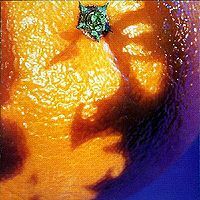 Besides, Tweezer Reprise was in its infancy (it had only been played twice before, within this same week) and wasn’t yet an encore staple. All in all, a very good, very solid show. I think of shows from this period, knowing that any given show must have been a ‘first show’ for at least a couple of people, and I try to think what it must have been like as your first experience with Phish. That would have been quite a treat, I believe.